Gwadar Golf City is an exclusive housing development located in Gwadar Port City. It is project of BSM Developers, the company is owned by Mr. Bilal Bashir Malik who is the grandson of renowned property magnate Mr. Malik Riaz Hussain. 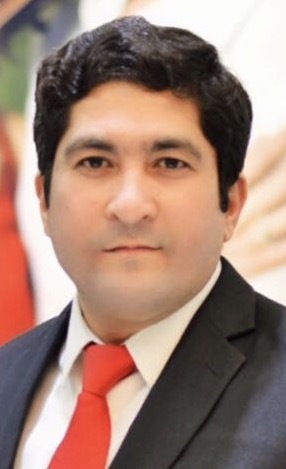 BSM stands for Bilal Steel Mills, and its owner Malik Bilal Bashir is the CEO of BSM Developers. 10 % Discount on Full Payment of Residential Plot as well as in 200 Sq Yards Commercial Plot. NOTE:- 100 Sq Yards Commercial Plot is not on Installments its total value is PKR 15,26,000 one shot payment and there is no discount in that. 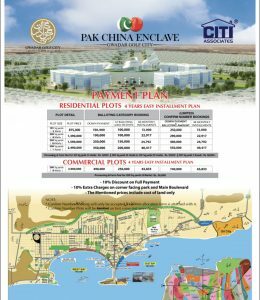 Procedure is very simple of booking of plots make pay order in the name of Gwadar Golf City of Down payment/processing fee amount and bring it to our office CITI Associates in Clifton Teen Talwar. We will give you receiving on our letter head of the company and submit your form with your relevant documents of 2 CNIC copy of Owner, 2 passport size photographs and 1 CNIC copy of Next of Kin (Nominee) after successfully submitting form in their office we will also give you their copy of acknowledgment. You can also remit to Mr. Shafi Jakvani CEO of CITI Associates account if you can’t make pay order his account details are attached with the name of booking procedure.